Life in the Schmidt House: No More Searching for the Perfect Gift! No More Searching for the Perfect Gift! 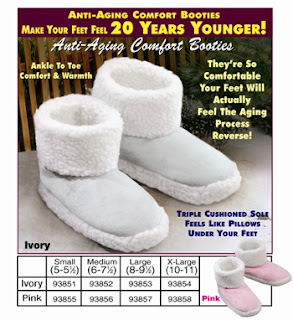 Here they are folks, Anti-aging comfort booties. Tired of worrying about all those years your feet have been putting on? Well I have great news for you--for only $12.97 you can slip on these dream slippers and "your feet will actually feel the aging process reverse". Tired of fumbling around in that dark bathroom trying to fix the plumbing? 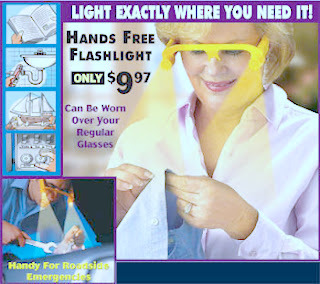 Don't turn on the light!--simply grab your hands-free flashlight and problem solved. Act now! Offer ends soon! now I know exactly what I want for my birthday. anti aging comfort booties.